Enter you details Please use only valid email id as we reply only to admins who mail from their registered mail id. And for any payment related replies need valid email id. So now you have registered and got admin account. Remember admin account is only to set payment details and track your earnings and request payment. You can't work with admin account. You need worker id to work with us. Then fill the form and create worker id. Now you have created worker id. You can create 10 worker ids per admin. 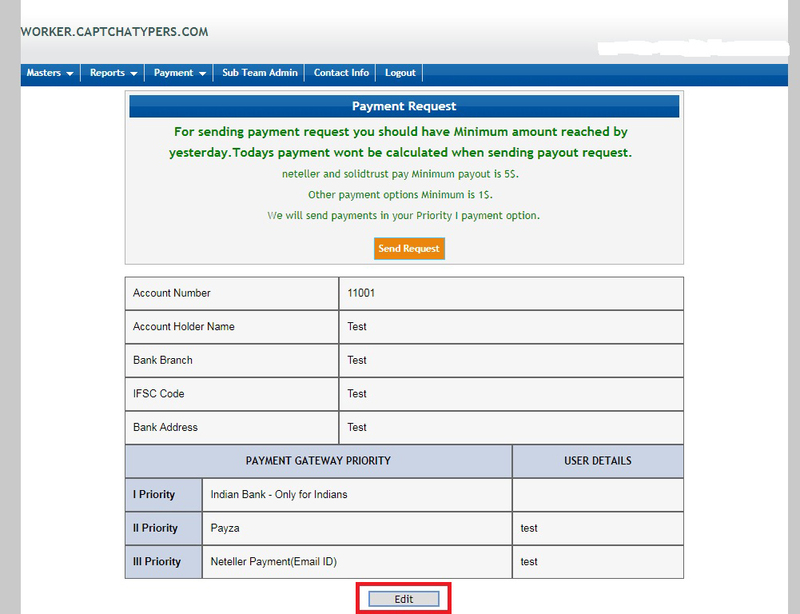 Before requesting payment click edit and enter your payment details. You can set 3 types of payment or like you want. Fill in your details and click update. Now your payment details are set. The count is calculated date wise. So you can always get payment only till last day. Todays payment won't be send when you request payment. Enter From Date and To Date in mm/dd/yyyy format, And you can check your earnings as per captcha type also. Why we provide admins instead of worker id? Admin id helps team manager to manage team under them. They can take commission and pay workers. They cant see how much they have earned. So team managers can manage their team well.And can earn commission. How workers can check their count or earnings? Workers can go to track details and check only their count and only for their id. They cant check other peoples count. And they cant check their earnings.They can only get their count. Perfect money, Webmoney, Bitcoin, Payza, Neteller, Vietnam Bank and Indian Bank. Recaptcha and text captchas, For working in recaptcha you have to download our app from your Instructions page And for working with text captcha, Login into worker.captchatypers.com and click Captcha entry or Captcha entry all and start working. Temporary and Permanently Banned Ids, When you leave lots of timed out your id will be banned for 10 minutes. But if you type garbage your id will be permanently banned. And payments won't be send for ids which are permanently banned. You can also join our Facebook page here https://www.facebook.com/Captchatypersoffical/ Happy Earning with captchatypers.